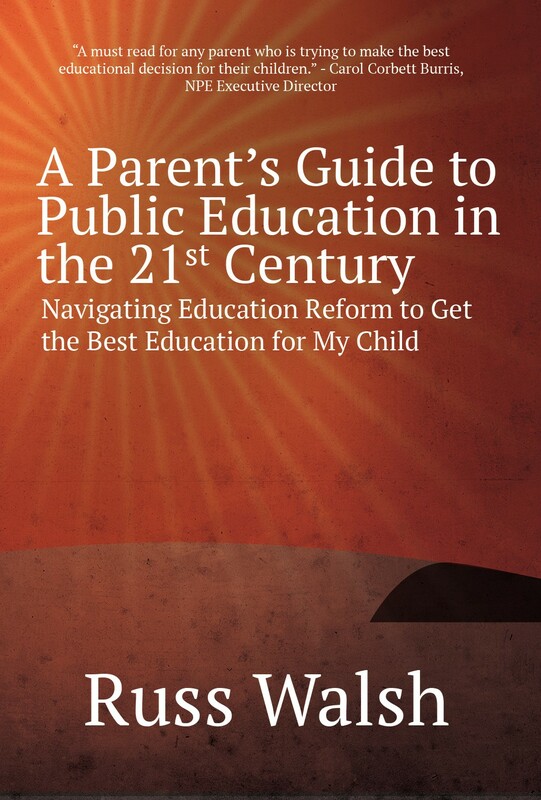 My new book, A Parent's Guide to Public Education in the 21st Century, is due to be released in about a week from Garn Press. The book is aimed at helping parents make informed decisions from the perspective of a public education advocate and corporate education reform critic. This Bill of Rights for School Children serves as a sort of preamble to the book. It is clear that in the near future public education faces tremendous disruption and change. How this great American institution emerges from this change is of critical importance to every parent and child in the country. In the city of New Orleans, the system of public education as we have known it has been almost entirely replaced by a system of privately run, publicly funded charter schools. In other cities, like Philadelphia and Detroit, where adequate resources have long been denied to the public schools and where the public schools have been struggling for decades, more and more of the responsibility for educating the children has fallen to charter schools, both brick and mortar schools and cyber schools. The current crop of education reformers argue that these changes are necessary, that the situation in many inner-city schools demands that we try something new. There is no question that something must be done to improve the quality of the learning experiences that children get in the inner cities. What the education reformers miss is that the public school system, any public school system, is both a reflection of and a product of the community where it resides. Reform cannot be focused on one element of that community, like the schools, and be successful. We have seen that in the United States public schools in affluent areas consistently perform at a very high level. We see this in community after community, county after county, state after state, all across the country. Parent income is the single best predictor of student readiness for college and career. It is notable that in many of these affluent communities, teacher unions are strong and vocal, charter schools are virtually non-existent and test scores and every other measure of student learning are off the charts. Every one of these communities has both been able to and willing to make a financial commitment to quality public schools. Strong unions have not stood in the way of strong student learning. Teachers perform at a high level. Principals and other administrators are both qualified and highly engaged in producing quality learning. It seems obvious that if we are going to improve public education in the economically struggling inner cities, we must take a holistic view. We must attack poverty with as much vigor and energy as the education reformers bring to their lobbying efforts in support of opening more charter schools. We must provide children in the inner cities with more services than schools in affluent areas because these children need more help to become proficient learners. This means wrap around services like medical and dental screenings, increased availability of counselors to help children navigate the trauma of their daily lives, home-school counselors that assist struggling families in providing experiences for their young children that will help them when they get to school, and professionally run and developmentally appropriate pre-school programs. All of these things will help and they will help much more than sending a child across town to a new charter school that has promised to raise student test scores. Education reformers have it wrong. We cannot end poverty by improving educational opportunity. Education has proven a way out of poverty for a select few of course, but for most children, the debilitating impact of poverty cannot be overcome in the classroom. To truly serve these children we must first concentrate on ending income inequity. If we can make significant strides in improving the economic outlook of the 24% of American children living in poverty, improved educational opportunity will be the joyous and very predictable outcome. As we look to future, it may be useful to consider some principles about public education that, for me at least, seem immutable. A Bill of Rights for the school child if you will. 1. Every child has a right to a free, high quality, public education. 2. Every child has a right to attend a well-staffed, well-resourced, clean and safe local neighborhood school. 3. Every child has the right to be taught by well-informed, fully certified, fully engaged teachers who care about the child as a learner and as a person. 4. Every child has the right to a school that provides a rich and varied curriculum that includes the visual and performing arts, integrated technology, and physical education. 5. Every child has a right to a school that provides a rich and varied extra-curricular program including athletics, clubs, and service learning opportunities. 6. Every child has a right to instruction that is well-planned, engaging, and collaborative. 7. Every child has a right to instruction that is developmentally appropriate. 8. Every elementary school child has a right to daily recess. 9. Every child has the right to go to a school with adequate support personnel including librarians, nurses, guidance counselors, and learning support specialists. 10. Every child has a right to an element of choice in the educational program, including the right to choose to take advanced level courses. As parents it is of course in our interest to see that all of these things are available to our own child, but it is also in every parent’s interest to make sure that every child has this opportunity. The world that our children will inhabit in the future will be populated by an increasingly diverse citizenry. If we want the best that this country has to offer for our own children, we must work to ensure that every child in this country has similar opportunities. For our own children to reap the benefits of the American Dream, to live happily, freely and securely in the challenging world of the future, we must make sure that everyone’s children have access to that same American Dream. Teacher Accreditation: A Game of Trivial Pursuit?